rettorically speaking: Rise from your slumber! So I've been reading up a significant amount about our lovely little country and her history - independence, politics, riots, music, the whole lot. It's fascinating and I feel very small indeed about how little I know. Some of these things were taught in Social Studies in school but quickly forgotten after the exams were over. Today I had the pleasure of referring to work I'd previously written for a new article. A good feeling for sure. 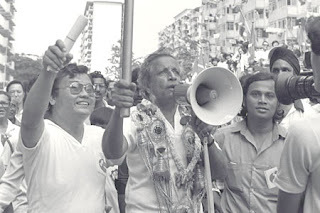 I'm currently writing an article about the National Anthem and how it was first played to the public when Yusof bin Ishak was inaugurated as the first Yang di-Pertuan Negara (Head of State) and I can just imagine - following a 17-gun salute, the first President emerges to the grandeur of Majulah Singapura to a 2,500-strong crowd, who was hearing the anthem for the first time, waiting at The Padang. I've also been reading a book by JBJ titled The Hatchet Man of Singapore (guess who?) and it's very enlightening. It's also very saddening. But oh how much I've learnt - about politics in days past, how it applies and still carries on till today, the role of the Catholic Church in the '87 arrests, why I should cut Father Patrick a bit of slack for his rigid ways and lots more. But more must be learnt before anything more is said. Everyone should read this book, and JBJ's call for us all to "rise from [our] slumber" will surely manifest. Also I had a very annoying FB discussion with someone who says that Oscar, Edgar, Vincent, Henry and other legendary writers/artists could have prevented dying penniless if they had better marketing. Yes. Better marketing, Mr. Wilde, you got that? urgh.